Tesla's new electric semitractor-trailer is unveiled during a presentation in Hawthorn, California, Nov. 16, 2017. 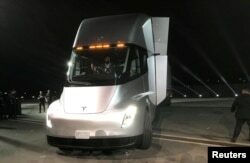 CEO Elon Musk said the semi is capable of traveling 500 miles on an electric charge and will cost less than a diesel semi considering fuel savings, lower maintenance and other factors. Musk said customers can put down a $5,000 deposit for the semi now and production will begin in 2019. “We’re confident that this is a product that’s better in every way from a feature standpoint,” Musk told a crowd of Tesla fans gathered for the unveiling. Musk said Tesla plans a worldwide network of solar-powered “megachargers” that could get the trucks back up to 400 miles of range after 30 minutes. But the semi also piles on the chaos at Palo Alto, California-based company. Tesla is way behind on production of the Model 3, a new lower-cost sedan. It’s also ramping up production of solar panels after buying Solar City Corp. last year. Musk has said Tesla is also working on a pickup and a lower-cost SUV and negotiating a new factory in China. Meanwhile, the company posted a record quarterly loss of $619 million in its most recent quarter. Long-haul semi trucks, on the other hand, would be expected to go greater distances, and that would be challenging. Right now, there’s little charging infrastructure on global highways. Without Tesla’s promised fast-charging, even a midsized truck would likely require a two-hour stop, cutting into companies’ efficiency and profits, says Brian Irwin, managing director of the North American industrial group for the consulting firm Accenture. Fleet operators want reliable trucks, and Tesla will have to prove it can make them, said Michelle Krebs, executive analyst with the car shopping site Autotrader.